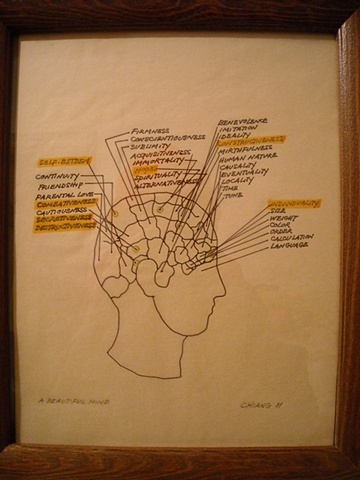 This work is inspired by a phrenology chart. In the late 1700's, Dr. Franz Joseph Gall of Austria discovered the link between the form of the skull and the functions of the brain. Through observations and extensive measurements, Dr. Gall was able to link aspects of character to precise locations in the brain. This is in honor of my brother Peter Chiang, January 15, 1958--July 29, 1982.